*The 2nd camp is found in the Challenge Tomb. The 3rd camp appears after you leave this area and allows you to fast travel back to the waterwheel cavern in case you missed anything. Neither of these is counted in the total on the in-game map. 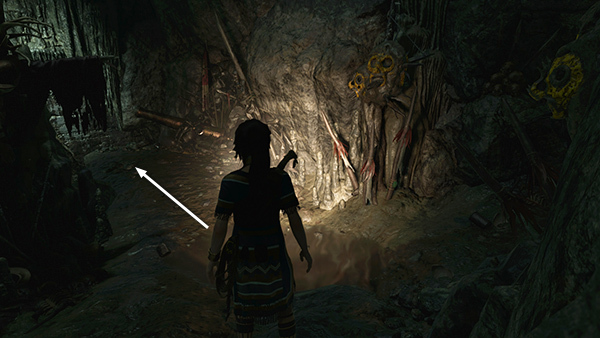 CLIFFS ABOVE THE CENOTE: Go through the doorway near the campfire to find a document (1/6), Journal of T. Serrano 2 (The Missionary) sitting on the ground, along with some hardwood and a resource container. Collect what you need and scramble up into the opening on the left. 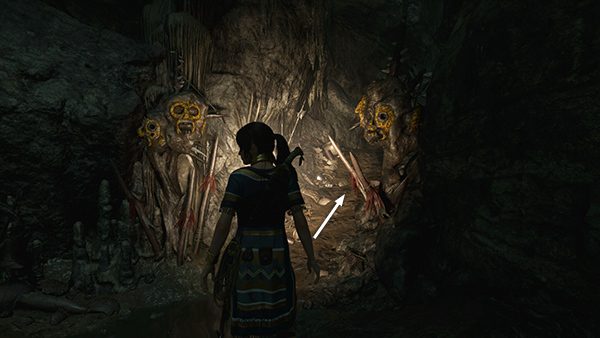 (screenshot) As you follow the path, Lara comments on the unusual decorations, which she says are neither Maya nor Inca. Continue to the bottom of the path, gathering a few more resources on the way. Jump into the pool far below. If only every goal were that easy to achieve! SUNLIT POOL: There are quite a few useful items scattered around the bottom of the pool but also a school of piranhas. Fortunately they tend to patrol a certain area, the deep trough along the east side of the pool, so you can avoid them if you're careful. There's no need to put Lara at risk for minor pickups like aquatic plants, but there 5 small treasure chests on the bottom. Each contains some jade ore, and opening them also counts toward a Challenge: Sunken Treasure. 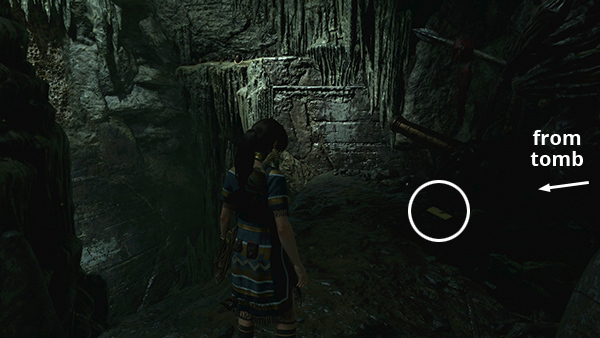 The locations of these treasure chests are shown in these screenshots and marked with yellow dots on the annotated level map. 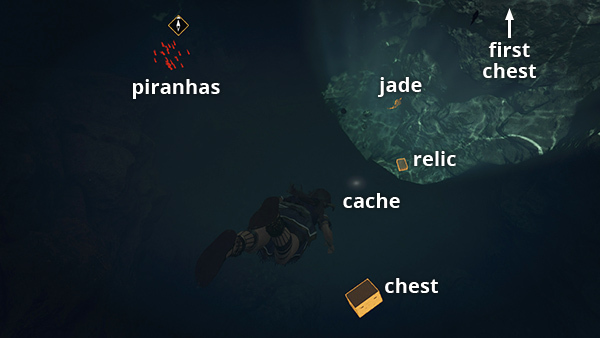 There's also a survival cache (1/8), a relic (1/5), Crucified Figure (Mam/Homecoming), and a vein of jade ore near where you first splash down. (screenshot) These items are marked on the map as well. Watch out for the patrolling piranhas, especially when going after the relic and survival cache. There's also another jade deposit embedded beneath a rocky ledge just north of the large, squarish rock that protrudes above the surface on the southeast side of the pool. The locations of the jade deposits are also marked on the map with green dots. On the southeast shore of the pool, you'll find another buried survival cache (2/8). You should be able to spot it when standing on the squarish rock or swimming around that area. (screenshot) Just to the right (west) of the cache there's a tattered effigy (1/5) hanging from a wooden frame. Use a rope arrow to pull it down and initiate this level's second Challenge: Respected. (screenshot) The rest of the effigies are found later in the level. All are marked with red dots on the map. 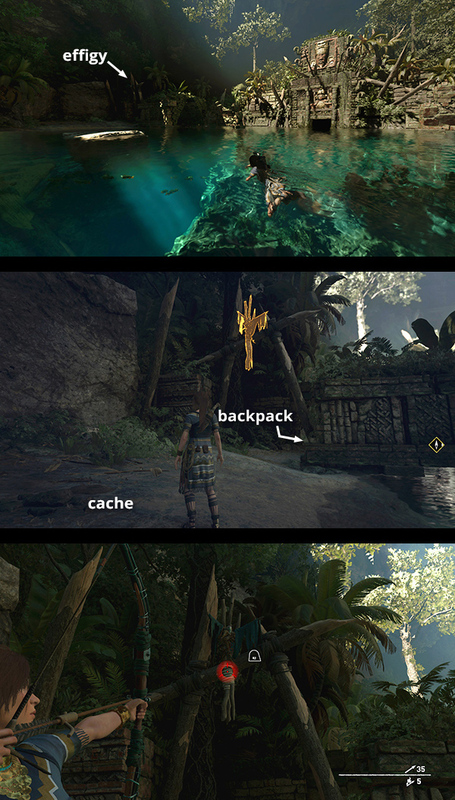 Now enter the crumbling structure to find an explorer backpack (1/1) (screenshot), which reveals the location of several other survival caches on your in-game map. (If you missed the first cache, this will help you find it.) There's one more major item in this area. Swim across to the crumbling archway on the north side of the pool, opposite the archway where you found the backpack. 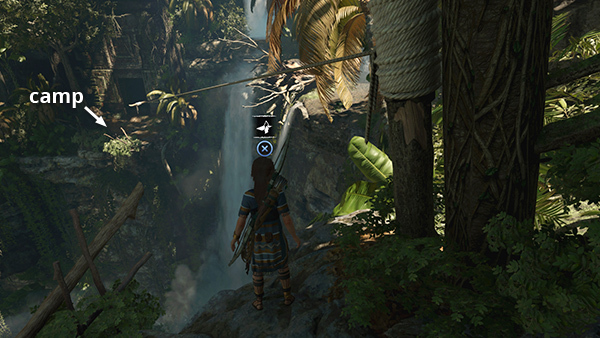 (screenshot) Use a rope arrow to pull down the wooden barrier. Behind it is an archivist map (1/1). 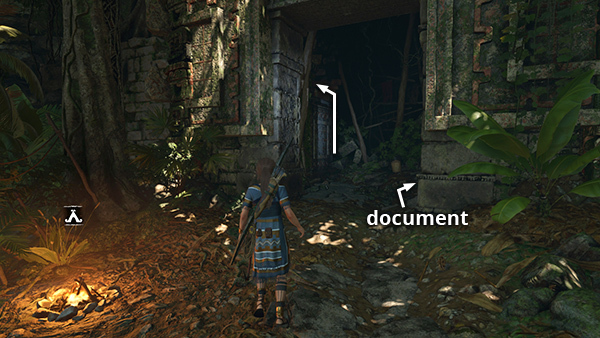 (screenshot) Examine it to reveal the locations of a number of documents and relics. As you squeeze through the narrow opening at the top of the path, another creepy creature looks down on Lara from a ledge just ahead, squeals alarmingly, and disappears deeper into the cavern. You're also notified of a nearby challenge tomb. If you'd like to explore the optional tomb, head to the right (east). (screenshot) To continue along the main path, turn left (west). (screenshot) Skip the next paragraph. SAN CORDOBA CHALLENGE TOMB ENTRANCE: Follow this link for the SAN CORDOBA CHALLENGE TOMB WALKTHROUGH, which includes the Collapsed Temple Base Camp, 1 document (3/6), 2 relics (3/5 and 4/5), and 3 survival caches (4-6/8). 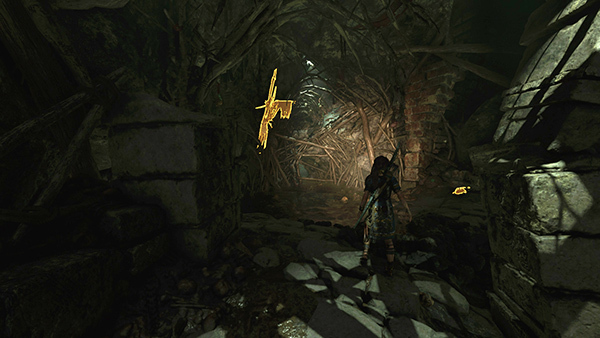 Examining the tomb stele unlocks the Scavenger Skill Caiman's Breath II, which further increases Lara's breath capacity. BASE CAMP WITH MASSACRED TRINITY SQUAD: Cut the rope suspending the dead soldier. Lara rolls the decaying corpse over and takes his weapon: the BISHOP 600 SHOTGUN. 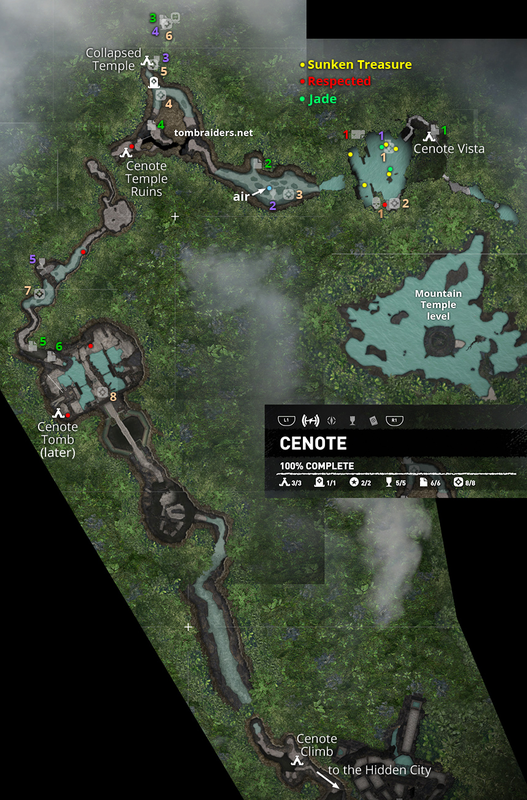 Crack open the salvage crate and have a rest at the Cenote Temple Ruins Base Camp. You can probably make a few upgrades to your new gun, and you may have a couple Skill Points to spend. If you purchased the Croft Edition (or other DLC including shotguns), you'll unlock the SEDGEWICK 707 SHOTGUN at the same time. It does a bit less damage per round than the Bishop, but it has better stats in other areas. If you have skill points to spend and you haven't already unlocked the Puma's Feint Warrior Skill, I recommend doing so now. It will be very helpful going forward. If you already have it, maybe go for Heart of the Jaguar I, II, and/or III. The first of these enables Lara to use Endurance mixtures, which reduce damage from both melee and ranged attacks. The advanced versions reduce damage from fire and explosions, and increase breath capacity when swimming, and increase the length of time these protections apply. Otherwise, choose what appeals to you. INTO THE WARREN: When you're ready to move on, select your new shotgun (4 on the keyboard or D-Pad Left on the controller) and use it to blast the shotgun barrier to the west of the campsite. Squeeze through the narrow opening into the next room. Gather various supplies here and continue to the west through the low tunnel lined with branches. The Uruk-hai looking dude rushes out screaming and tackles Lara. The wooden floor gives way and Lara and the strange warrior tumble into the room below. Lara kicks him off of her, scrambles to her feet, and retrieves the shotgun. Four more cave dwellers (3-6) appear in the raised opening in the southeast corner. They are courteous enough to jump down and rush at Lara one at a time. So, again, wait until each one gets close before firing. Or, if you've unlocked the Puma's Feint skill, use it to kill them without expending any ammo. The page with screenshots includes details. When you've taken care of those three, a short cutscene shows four enemies rushing the wooden gate in the southwest corner. Once you've dealt with these three, the fight is over, and Lara says, "Time to move." Be sure to loot the corpses and pick up the shotgun and rifle ammo near the pillars if you didn't get it earlier. 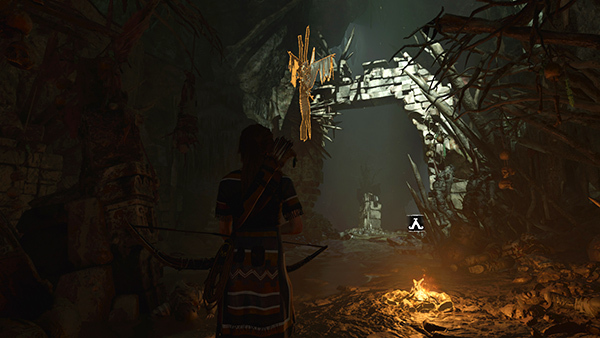 In a short cutscene, Lara surveys the elaborate construction below and wonders what might lie beyond the large, round door. Then she cuts the rope and drops into the pool. ANCIENT GATE WITH WATER WHEELS AND SPIGOTS: There's a salvage crate and a few other resources on the bottom of the pool, as well as a few items behind wooden barriers that you can't reach yet. Swim under the wooden axle connecting the two large wheels, and climb out of the water in the far left (southeast) corner. Dig up a survival cache (8/8) buried beneath the collapsing stone arch. 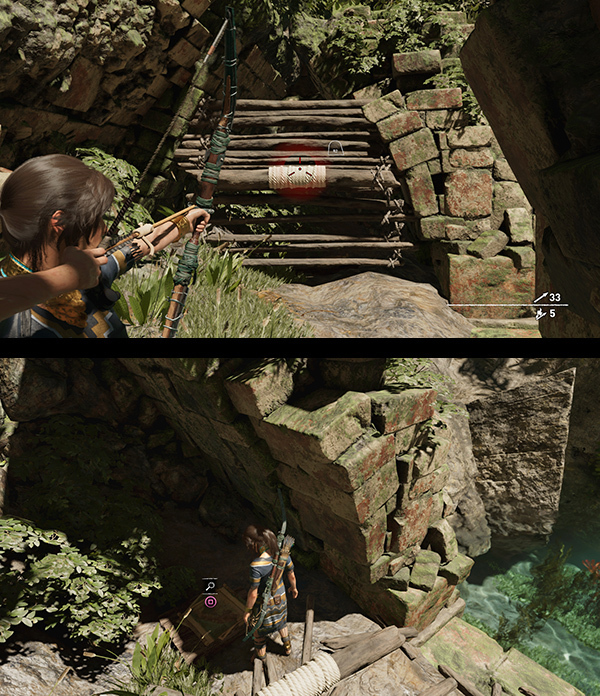 (screenshots) Lara goes into a defensive crouch here, but the area near the cache is safe for now. 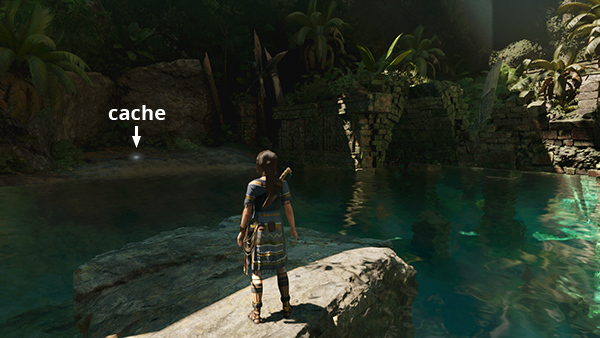 NOTE: The annotated level map shows the Cenote Tomb Base Camp here, but it does not appear until you've finished the level and moved on. It will allow you to fast travel back to this area later in case you miss any collectibles. As the wheel turns, it opens the first huge, circular door. It also attracts the attention of several enemies. Lara takes cover behind the winch as 2 archers open fire from the ledges near the spigots. The water flows down onto the wheel, operating the mechanism that opens the second door. The Yaaxil don't seem quite sure what to make of this. 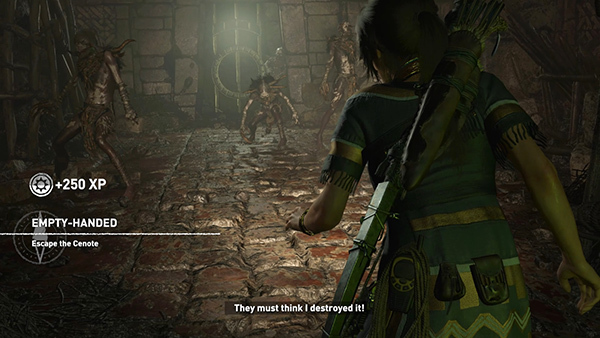 As Lara moves through the doorway, they gather around but do not attack or even attempt to cross the threshold. Their leader, an imposing woman made up to look like Queen Amidala's evil twin, makes her way to the front of the crowd. She and Lara size each other up, but neither makes a move as the huge door rolls shut between them. 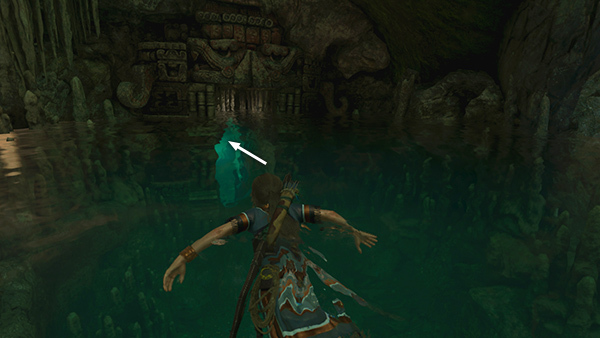 Lara moves further into the hall and discovers a mural depicting the Yaaxil, goddesses of protection, who may have forged the Silver Box of Ix Chel and now protect it. Lara moves out into a large, sunlit chamber. She brushes the vines away from the central dais to reveal an eclipse-and-heron motif, similar to to the one in Unuratu's tattoo. But when she uncovers the compartment where the box should be, it's empty. A tremor then shakes the temple, destroying the circular door. This displeases the Yaaxil leader greatly, and she shrieks a signal for her warriors to attack. Lara takes off running out the other side of the temple. 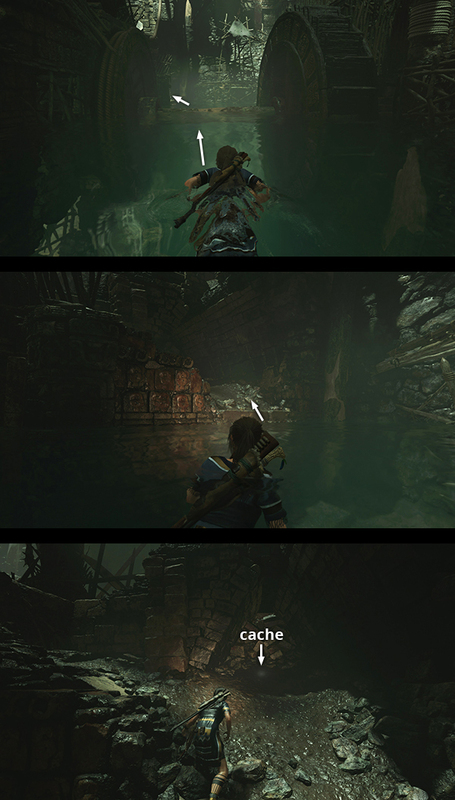 NOTE: If Lara dies before this checkpoint, the game reloads near the temple exit with Lara facing the wrong way. (screenshot) She'll say, "They must think I destroyed it," meaning the Box. Don't bother fighting the Yaaxil who surround her. Just turn around and start running, as described in the section above. 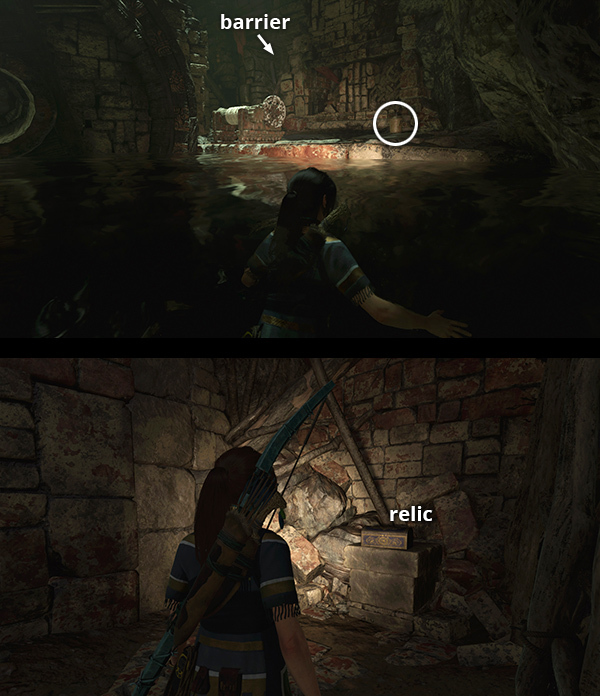 In a brief cutscene, Lara scrambles away from a hail of Yaaxil arrows and slides down into a pool. FLOODED PASSAGEWAY: Swim down through the opening to the south. Follow the flooded passageway to a pocket of trapped air. Take a breath and continue southward. The tunnel slopes upward until you can surface in a cavern. 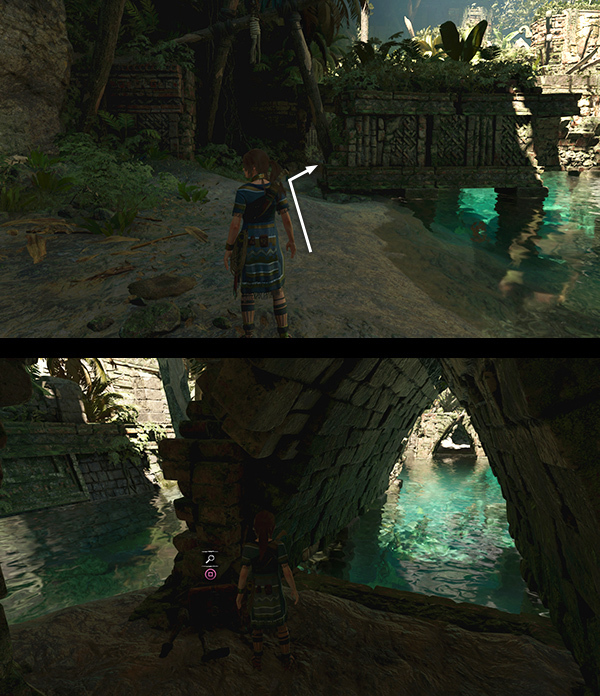 NOTE: An on-screen notification says you've re-entered THE HIDDEN CITY, but if you check the map, this area still reads as being part of the CENOTE. Lara retrieves the OVERHANG CLIMBING GEAR from its unfortunate previous owner. REVISITING THIS LEVEL LATER IN THE GAME: It is possible to achieve 100% completion the first time through the CENOTE, but if you missed anything, you can return later by fast traveling between base camps. 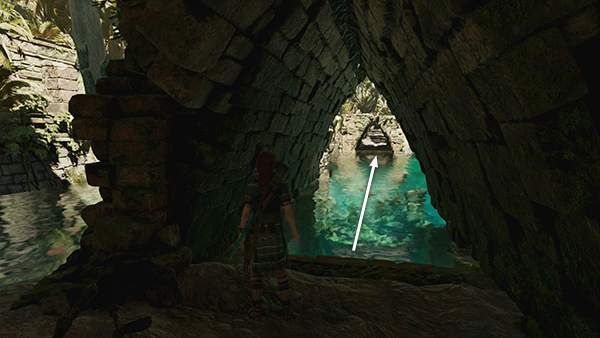 Note that the Cenote Tomb Base Camp appears in the cavern with the huge, round door and waterwheels, once you've completed the level, making it much easier to get back there. If you didn't explore the SAN CORDOBA CHALLENGE TOMB on your first pass, you may not have discovered the Collapsed Temple Base Camp yet. 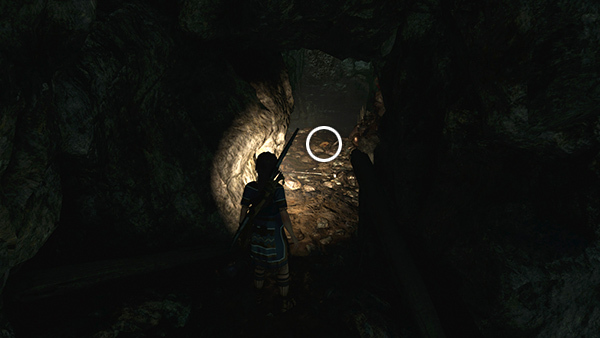 The next closest camp to the Challenge Tomb is the Cenote Temple Ruins Base Camp, where you found the SHOTGUN. To reach the tomb, fast travel back to that camp. Then follow the instructions on this page with screenshots. I will add a complete COLLECTIBLES GUIDE later. Meanwhile, if you have trouble finding anything, I'm happy to help. †UPDATE HISTORY: 11/10/18 - First draft of walkthrough posted online. 11/26/18 - Added skill recommendations.